Kiss’ Hot in the Shade tour wasn’t a sellout, but it was well received by fans who appreciated that a bunch of older songs were back in the set. The tour was unfortunately highlighted by the June 15, 1990 date in Toronto, igniting a feud with Whitesnake. Kiss were third on a four-band bill, with David Coverdale, Steve Vai and company in the headlining slot. Paul Stanley used his stage raps to complain that Whitesnake wouldn’t let them use their full setup, including a giant sphinx. When Whitesnake hit the stage, it was to a chorus of boos. Steve Vai later stated that it was the first time he had ever been booed. Vai once even walked onstage to the sound of people chanting “Yngwie! Yngwie! Yngwie!”, but he had never been booed until the incident with Kiss in Toronto. When the tour wrapped up in November, Kiss took a few months off before gearing up again in the new year. It was to be another album, another tour, but suddenly real life interfered. Eric Carr hadn’t been feeling well. Flu-like symptoms turned out to be heart cancer. Simultaneously, Kiss received an offer to record a song for the sequel to Bill & Ted’s Excellent Adventure. Carr underwent surgery in April, with chemotherapy following. Having little choice, Kiss recorded without him. Eric Singer, who had performed so well on Paul Stanley’s solo tour, filled in on drums. Eric Carr, in a wig, was able to play for the music video taping. He gave his all, and did a full day’s shoot, with excellent (pun intended) results. 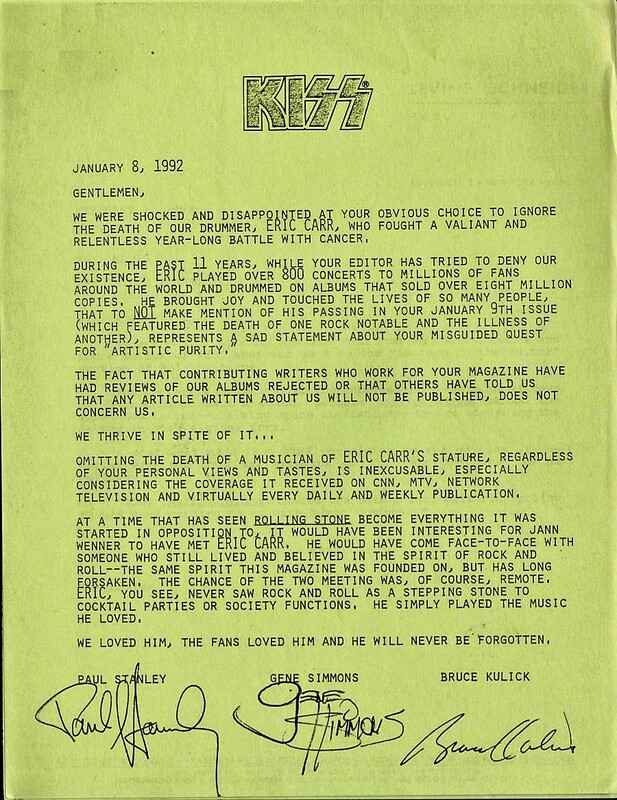 Unfortunately a rift was developing, with Eric Carr feeling shunned and excluded from Kiss. He was afraid he was going to be replaced, permanently, and his relationship with the band was strained. Although everybody hoped Eric would make a full recovery, he passed away from a brain haemorrhage on November 24, 1991. Eric Carr was 41. If anything positive came from Eric Carr’s death, it was that Kiss were going to put all that anger and frustration back into the music. The music was to be their Revenge. It started with “God Gave Rock & Roll to You II”, a re-imagining of an old Argent song for the Bill & Ted movie. Eric Carr may not have been well enough to play drums, but that didn’t stop him from singing. His vocals on “God Gave Rock & Roll to You II” were his last. The song wouldn’t be the same without Carr, as he can be heard sweetly harmonising with Paul Stanley. Eric Singer wasn’t credited on the single, or the final soundtrack for Bill & Ted’s Bogus Journey. It simply says “performed by Kiss”. “God Gave Rock & Roll to You II” was important for two more reasons. First, and very significantly, it was produced by Bob Ezrin. Ezrin was responsible for the two albums that some consider Kiss’ best, and Kiss’ worst. It had been 10 years. A Kiss-Ezrin reunion was very big news for fans. It indicated that Kiss meant business this time. Secondly, “God Gave Rock & Roll to You II” was the first Paul Stanley/Gene Simmons (with Bob Ezrin and Russ Ballard) co-writing credit since 1985, and their first shared vocals in ages upon ages. 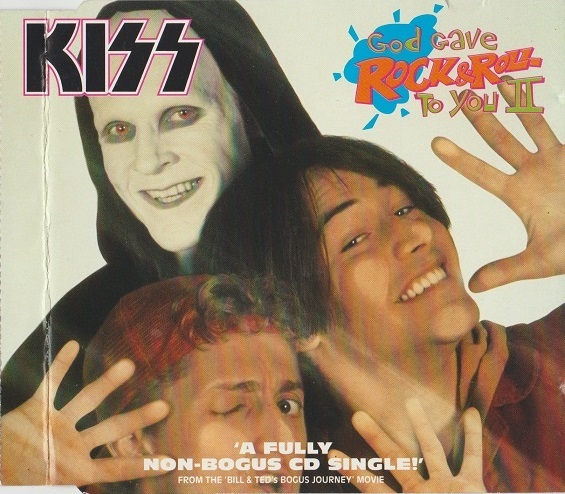 Although it didn’t make waves in 1991, “God Gave Rock & Roll to You II” has become enough of a favourite to make it onto 2015’s Kiss 40 compilation, and continue to be played live. It shows off what Kiss can really do. Yes, they can sing! Yes, they can play! This lineup could do it particularly well. It’s appropriate that Eric Carr went out on a good Kiss track. And Eric Singer was the right guy to continue. There are three released versions of “God Gave Rock & Roll to You II”: The single edit (3:57), the soundtrack version (5:23) and the final 1992 version that was later released on the next Kiss album (5:19). The single edit cuts out too much of the grand, pompous arrangement, including the epic opening. In an ironic twist, the version of “God Gave Rock & Roll to You II” that is in the movie has a guitar intro solo by Steve Vai. The same guy whose band got booed in Toronto thanks to Kiss. The CD single is rounded out by two more songs from the Bill & Ted soundtrack, by Slaughter and King’s X. The King’s X track, “Junior’s Gone Wild” (previously reviewed in our mega King’s X series) has never been one of their better tunes, but as a non-album rarity, a nice one to have. Just don’t judge King’s X by this one track. Slaughter turned in something better, a fun party tune called “Shout It Out”, also a non-album recording. Slaughter, of course, were one of Kiss’ well-received opening acts on the Hot in the Shade tour. And what was their Kiss connection? Mark Slaughter and Dana Strum were in a band with Kiss’ old guitar player, called the Vinnie Vincent Invasion! As work proceeded on the next LP, the world suddenly changed. Hard rock was out, and grunge took over MTV. This single bought Kiss a little bit of time, but it was going to be the longest gap between Kiss albums yet — three years. Revenge had to wait a little longer.